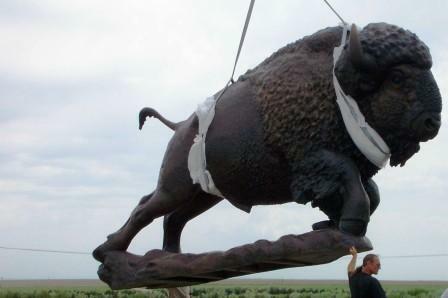 The "Buffalo Bill Bronze" project took six years from its conception as a sketch on a napkin in a restaurant in Garden City in 1998 to its dedication at its present site in Oakley in May of 2004. The sculpture is owned by the Wild West Historical Foundation, Inc. It was voted as one of Kansas' top 8 Wonders of Art. Sculptor Charlie Norton and artist wife Pat, Leoti, worked on the monumental bronze for almost three years. It was cast in hundreds of pieces that were welded together. The buffalo weighs approximately 4,000 pounds and contains a time capsule. Buffalo Bill on his horse weighs approximately 5,000 pounds. The horses head would fill the entire bed of a pickup truck. Thousands of people each year, from all over the country and the world, come to have their picture taken with the statue.